Posted December 2, 2015 by Jackie McMillan & filed under Bar, Bar Food, Booze, Eat & Drink, Foodie Diary, Japanese. When I want to drink Japanese whisky I head to Tokyo Bird. And this Surry Hills small bar is making it hard not to want to drink whisky on Tuesday 22 December with their inaugural Christmas Whisky Dinner ($135/person). 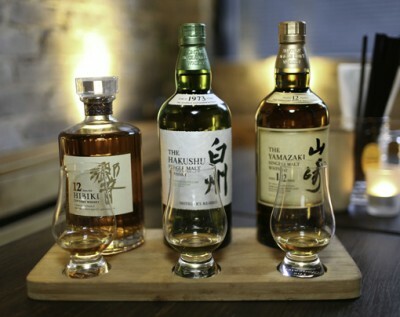 Attendees will quaff five Japanese whiskies from both major distilleries – Suntory Whisky and Nikka Whisky – and independent Japanese whisky distilleries, which are not available in the local market. They’ll be matched to an array of dishes to stop you falling over. Book quickly – while they are doing two sittings (6pm/8.30pm), the bar is tiny. Taking two products which are synonymous with Tasmania – whisky and pinot noir – and merging them into one excellent drink, the Hellyers Road Single Malt Whisky Pinot Noir Finish ($92.80), was a stroke of brilliance. The resulting whisky, finished in premium pinot noir casks, has some upfront sweetness from the marriage, so it suits a post-meal cheese platter application. I found it benefited from a splash of water to extend the palate length, ensuring you get to savour all those barley characteristics that Hellyers Road are famous for. This whisky was also included in the Top Ten – Value for Money whiskies at the UK’s Global Whisky Master Awards alongside more mass-produced spirit brands like Jameson 18 Year Old.